This trendy new office overlooking St Mary’s Cathedral in Sydney has been transformed into a perfectly contemporary and sophisticated workspace using a simple yet effective colour palette. Designed by The Bold Collective, the clever selection of predominantly black and white colours made a distinct impact on the space. 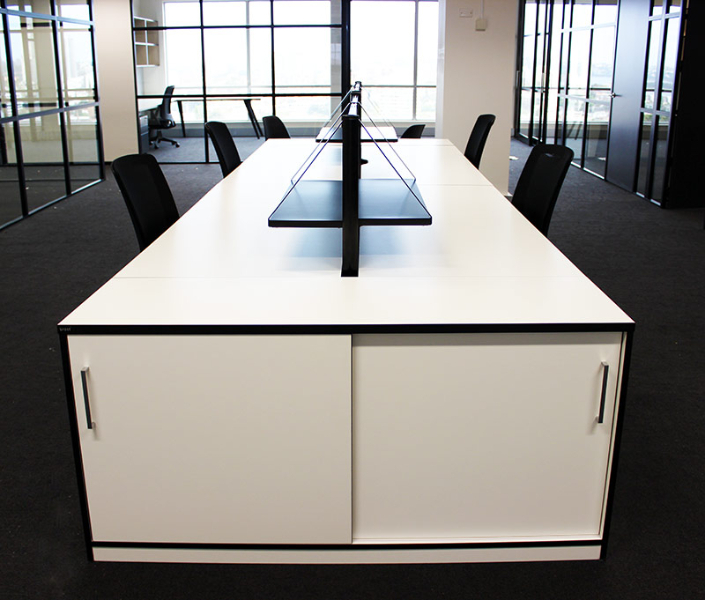 The furniture included our Benchwork workstations, black Globe pedestals and our brand new Miro task chair. Black Dart legs featured in other areas including the boardrooms and offices. The unique design of the leg perfectly complimented the style of the office with its glass partitions, black trims and beautiful light pine flooring throughout the reception. Other products included Melamine Lockers, Universal Storage, Tambour Door units, Sonic chairs andBop ottomans, all carefully collaborating to create a bold and unique look.